Because of the extensive range of tooling within a CNC Swiss machine, medical device components can be completed without further processing. Processes include turning, milling, cross-holes, slotting, knurling, threading and more. Marshall Manufacturing utilizes CNC Swiss machining to ensure fast cycle times, efficiency, flexibility and precision. The capabilities of the CNC Swiss machine are vast, as is the knowledge of the professionals who tool and program them here at Marshall. 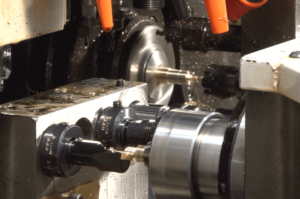 CNC Swiss machines have the ability to perform long turning operations without material deflection because the tooling is only .050” from the guide bushing, offering great rigidity to the process. The Swiss machine can perform milling, cross-hole drilling, axial drilling, eccentric axial drilling, threading and knurling functions. It also has a second spindle that can provide multiple machining operations to the back end of the component. Marshall uses CNC Swiss machines for smaller, complex medical components. Often precision parts can be produced and completed in a single Swiss machine. As a leading medical contract manufacturing company, our customers know we have the ability and know-how to produce their components to specification, on time and on budget. The Tornos Swiss Nano machine was designed to produce very small parts, with extreme quality and precision. In the world of medical device manufacturing, components are getting smaller and smaller. As these components decrease in size, their dimensional tolerances become increasingly tighter. Marshall has a history of providing high quality micro-machined medical components and assemblies to our customers. Satisfying our customers is our highest priority.